It’s spring time. That means it’s time for spring cleaning. 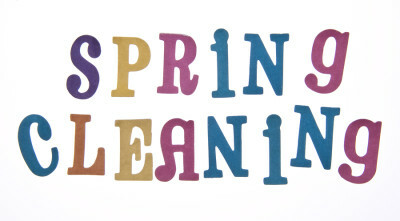 We’ve got 5 great spring cleaning tips for you in this article. We hope they help you make your house beautiful for spring. Organize your closets. Some say that organizing your closet is the first step to organizing your home. You should go through all your clothes and accessories and get rid of what you are no longer using or what doesn’t fit for whatever reason. A good suggestion is to organize what you currently wear by how you get dressed in the morning and by color. Not only will your closet look appealing but your everyday routine will be easier. Make your welcome mat truly welcoming. Shake it, wash it and swat it with a broom. Give the mat a thorough cleaning, the toughest it can take. Remember, the welcome mat is your home’s front line of defense against tracked-in dirt. You should always keep the mat clean enough to operate at peak efficiency. Clean your windows. Dirty panes of glass present no problem when you use rubber-edged squeegees. They are quicker and more effective than cloth or newspaper. They come in a variety of sizes and a screw-on extension will allow you to reach high spots without a problem. To begin, dip a sponge into a bucket of warm water and a few drops of dish soap. Wet window and rub dirt away. Dampen the squeegee, starting at an upper corner, then take it down the pane from top to bottom. Repeat and overlap strokes while wiping the rubber edge with a sponge after each stroke. Dry the windowsills with a cloth. Wash walls, cabinets, baseboards and woodwork. Use a sponge and a dish-washing detergent on these areas. Be careful not to mess with the paint. Wash the surface in sections. A sponge mop will make it easy to reach high spots. You should use two buckets to accomplish this task – one with the dish-washing solution and the other for wringing out you sponge. Dry the walls and other woodwork with a clean cloth. Wipe your blinds if you have them. Wipe wooden blinds with a few drops of gentle wood cleaner and an almost dry sponge. Aluminum blinds can be washed outside. Place them on a sheet on a slanted surface. Scrub with water and non-corrosive cleaner. You can use a hose to rinse well and then you should dry the blinds with a towel to prevent rust. Of course, these are just a few spring cleaning tips that we can provide you with. We will have more in our blog next week. Until then, happy spring cleaning. Remember, you can call Maids Around Town to do your spring cleaning for you. Give us a call in Austin at 512-782-4578 and in Houston at 832-930-3210.